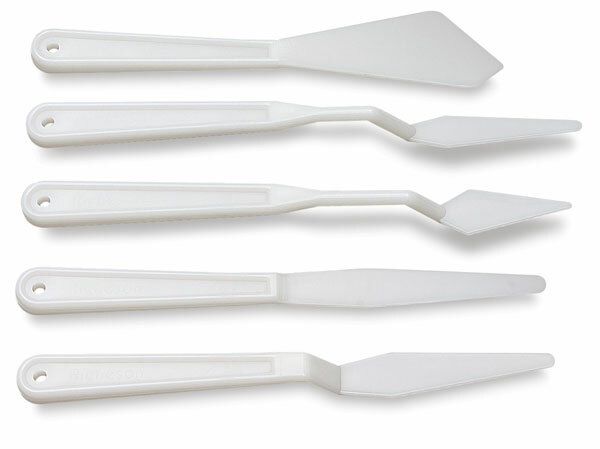 Safer to use than metal knives, these one-piece molded plastic knives are also economical, durable, and easy to clean. Canister of 60, Assorted Shapes — A perfect solution for the classroom, this set contains 20 each of the 3-3/4" Straight, 2" Diamond Trowel, and 2-3/8" Trowel Offset. Canister of 60, Large Painting Knife — An excellent classroom set containing 60 Large Painting Knives in our most popular "Scotty" shape. Housed in a convenient reusable classroom Canister with handle. 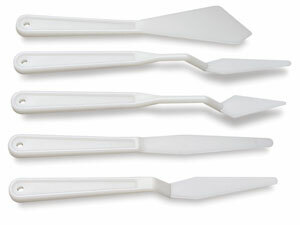 Set of 5 — This set contains one each of the following painting knives, the Large Painting Knife, 2" Trowel Offset, 3" Trowel Offset, 3-3/4" Straight, and the 2" Diamond Trowel.